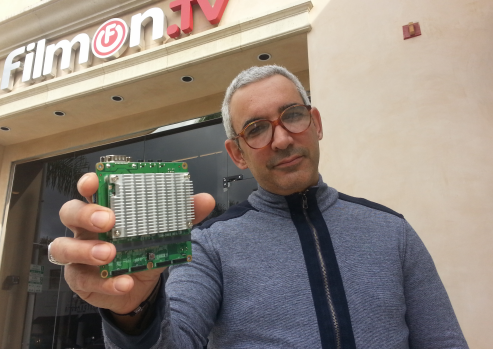 FilmOn, a service that streams live TV and movies over the internet, is reinventing itself as a cable company following last week’s Supreme Court ruling that barred a similar service, Aereo, from operating without a license. But the broadcasters, fresh off their victory over Aereo, are unlikely to stand still. I asked my colleagues on the West Coast to give it a try, and they reported it worked for them too — but they could only get the local New York NBC affiliate station, not the San Francisco one. According to FilmOn, this quirk is due to its “teleporter” technology that “transports” viewers in order to let them to watch TV through a mini-computer screen situated in New York. If you think all this sounds half-baked, you’re probably right. FilmOn, you see, is run by an eccentric billionaire named Alki David who delights in thumbing his nose at the broadcasters’ reluctance to license their signals over the internet. The broadcasters keep squashing him in court, but he keeps coming back. This time around, David is seizing on the Supreme Court’s words last week that streaming services like Aereo (and, by extension, FilmOn) are basically cable companies. In Alki David’s eyes, this means that the broadcasters must now treat FilmOn as a cable company by allowing it to use their signals in exchange for a fair royalty payment. He claims that FilmOn has long offered to pay but that the broadcasters have refused to negotiate with him — but now they don’t have a choice. In Alki David’s view, the copyright problem is now solved — since FilmOn is now officially a cable company, the broadcasters get paid and everyone is happy. The big broadcasters, however, are unlikely to see it that way, especially given their previous responses to FilmOn. In recent years, for instance, the broadcasters have sued FilmOn repeatedly. In their most recent court triumph, they obtained an injunction that barred FilmOn from retransmitting their signal anywhere outside of three states, including New York, where another court had said Aereo was legal. (This meant that FilmOn could continue to offer small local over-the-air TV channels, but not the big networks). John Hane of Pillsbury, a lawyer for the broadcasters, told me on Monday that FilmOn is definitely not a cable company — and can expect yet another lawsuit. FilmOn first described the device to the Financial Times in February as a way to watch out-of-town TV, but its legal and practical implications are unclear. A spokesperson, who conceded the legal argument is “aggressive,” said the Teleporter allows a user in San Francisco to claim they are actually watching TV in New York via a “split-screen” or a “mini-computer” attached to a thousands-mile long cord (I confess I don’t quite understand this argument). Hane, the broadcasters’ lawyer, said he had not heard of the “Teleporter” but said that FilmOn can’t retransmit the networks’ signal with that or any other device without permission. The bottom line is that Alki David appears eager to exploit the hole left by the Supreme Court’s unwise decision to shutter Aereo — but for now, he better put aside some of his fortune for some coming legal bills. Whether you think Alki David is crazy like a fox or just plain crazy, you have to give him credit for taking on this fight. The existing video distribution model is archaic and has to change. Maybe the ruling in the Aereo case (as flawed as it is) has created some cracks in the ice. I’m a LPTV broadcaster so I don’t have any sympathy for the Full Power guys but to me it was still a matter of taking something for nothing and selling it for a profit, plain and simple. Rarely is anything “free”. In my opinion, Aereo was a streaming “cable provider”, MVPD or whatever else you may want to call them. If Aereo had operated a “freemium” model it may have worked, offering teh off-air broadcst channels for free and charging for other channels. What also never gets reported is actual subscriber numbers for Aereo; this usually means the numbers are few. My opinion is that Aereo would have eventually collapsed for lack of a viable business model. In Aereo case, i always wondered if outcome would have been different if they also offered a “free” options. That would have made their argument stronger that they weren’t’ simply skimming the OTA signals & selling it for money rather it was customers who were using a free service to be able to watch the free telecast on new media (namely online). Not to mention $8/month is not a very attractive pricing model anyways for bunch of free channels. Hopefully FilmOn can learn from that.